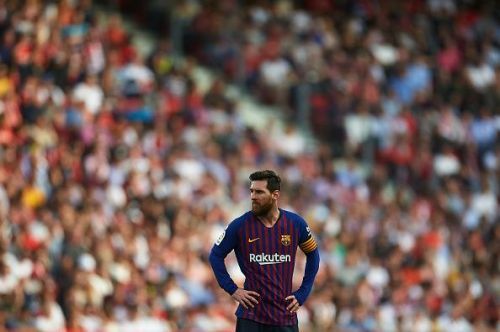 Barcelona captain Lionel Messi helped his side go ten points clear at the top of the table in La Liga after a masterclass performance that led the Catalan giants to a 2-4 victory over Sevilla at the Ramon Sanchez-Pizjuan Stadium. The night saw the Argentine ace register the 50th hat-trick of his career in what could only be termed a one-man show. The first half saw the Blaugrana trailing behind 2-1 to the hosts but swift Messi heroics after the break helped the league table-toppers secure the win. The hat-trick means that Messi is now only one treble away from equaling on-field rival Cristiano Ronaldo's hat-trick record. After the game, Messi put the spotlight on Barca's recent form, admitting that the team has had a rough patch but it is not uncommon in the game. Speaking to Sport English, the Argentine said, "You go through different spells in a season. You can't always play at a great level. We are on a run, if we're being honest, in which we are not playing our best football and that makes it difficult to score. When the play flows better, things work out for themselves. Today we were ourselves again and we played a great game." With the goals against Sevilla, the 31-year-old also extended his lead at the top of the European Golden Shoe race, with 25 goals to his name so far. The Barcelona captain is now three goals ahead of Paris Saint-Germain star Kylian Mbappe (with 22 goals) and six ahead of Juventus ace Cristiano Ronaldo (with 19 goals). AC Milan's Krzysztof Piatek currently sits at fourth spot place with 18 goals. Premier League forwards Mohamed Salah and Sergio Aguero follow close behind with 17 league goals. Messi has won the Golden Shoe a record five times and looks well on his way to win his sixth. Messi extends his lead in golden shoe race. No catching him now. Mbappé chasing Messi in golden shoe race.. Imagine if it happened. Messi getting his 6th ballon d’or and 6th golden boot and there’s absolutely nothing anyone of you can do about it. This isn't masterclass. This is a godclass from Messi. A hatrick rounded up with an assist. 6th golden boot already in the bag. Lol Messi is really going to win the European golden boot over CR7 that is balling Italian gardeners. Messi would have already won the 2004/05 European Golden Shoe. Thierry Henry and Diego Forlán won the Golden Shoe back in 2005 with 50. Messi is already on 50! There are still thirteen games to go. Mbappe scored 2 goals today. Good boy. A man who idolized Ronaldo is chasing Messi in golden shoe race. 😂😂😂 Damn.